"Iconium" redirects here. For other uses, see Iconium (disambiguation). For other uses, see Konya (disambiguation). Konya (Turkish pronunciation: [ˈkon.ja]) is a major city in south-western edge of the Central Anatolian Plateau and is the seventh-most-populous city in Turkey with a metropolitan population of over 2.1 million. Konya is an economically and industrially developed city and the capital of Konya Province. After its conquest by Turkish tribes, Konya became the capital of the Seljuk Sultanate of Rum (Anatolia) (1077–1308) and the Karamanids (13th century–1487). According to the Acts of the Apostles, the apostles Paul and Barnabas preached in Iconium during their first Missionary Journey in about 47–48 AD, having been persecuted in Antioch, and Paul and Silas probably visited it again during Paul's Second Missionary Journey in about 50. Their visit to the synagogue of the Jews in Iconium divided the Jewish and non-Jewish communities between those who believed Paul and Barnabas' message and those who did not believe, provoking a disturbance during which attempts were made to stone the apostles. They fled to Lystra and Derbe, cities of Lycaonia. This experience is also mentioned in the Second Letter to Timothy,. 19th century American theologian Albert Barnes suggested that Timothy had been present with Paul in Iconium, Antioch and Lystra. The city became the seat of a bishop, which in ca. 370 was raised to the status of a metropolitan see for Lycaonia, with Saint Amphilochius as the first metropolitan bishop. Under the Byzantine Empire, the city was part of the Anatolic Theme. During the 8th to 10th centuries, the town and the nearby (Caballa) Kaballah Fortress (Turkish: Gevale Kalesi) were a frequent target of Arab attacks as part of the Arab–Byzantine wars. The name of the town was changed to Konya (in Persian: قونیه‎ quniya) by Mesud I in 1134. In 1923 in the frame of the Population exchange between Greece and Turkey, the Greeks that inhabited the town of Konya left as refugees and settled in Greece. At the same time a significant influx of Albanians came and settled in the area. Konya is the center of the largest province, the largest plain (Konya Plain) and is among the largest cities in the country. It is the seventh most populated city in Turkey. The city is in the southern part of the Central Anatolia Region. The land is broad and flat with a lot of lowlands and plateaus. The plateaus are covered with rich steppes, therefore, affecting the agriculture sector. Additionally, the southernmost part of Konya is largely surrounded by the Taurus Mountains. The city and the southern parts of the greater Konya enjoy abundant sunshine across the country, resulting in big potential in solar farming. The largest solar farm of Turkey is located 20 miles west of the city. Beysehir Lake is on the western part of Konya and is near the border. It is known to be the largest fresh water lake in Turkey and one of the most important national parks. Beysehir Lake is important for tourism in Konya and attracts thousands of people each year to its 2 beaches and 22 islands for water and mountain sports. Lake Aksehir is on the border of the Afyon Karahisar province and it is famous from "Nasreddin Hodja" stories. The lake also provides a good habitat for famous "Aksehir cherries". Nalçacı Avenue in Selçuk, Konya. Jalal al-Din Muhammad Rumi, also called mawlana or Mevlana, was the inspirer of the Sufi Mevlevi order (known for the Whirling Dervishes and Masnavi). He died in Konya in 1273 and his mausoleum is located here. Mevlana Museum (1274) is the resting place of the Sufi mystic and poet Rumi in Konya, the capital of the Anatolian Seljuk Sultanate. Konyaspor is the football club of the city, that appear in Turkish Professional Football League. On May 31, 2017, he won the first national trophy of his history, winning Türkiye Kupası in the final against İstanbul Başakşehir in penalty shootout. The team repeated on August 6, 2017, following winning Türkiye Süper Kupası against Turkey's Beşiktaş champion. Clément Huart (1897). Konia, la ville des derviches tourneurs (in French). Paris: Leroux. C. Edmund Bosworth, ed. (2007). "Konya". Historic Cities of the Islamic World. Leiden: Koninklijke Brill. "About Konya/ Geography and Transportation". Konya Sanayi Odasi. Retrieved November 12, 2016. Gould, Kevin. "Konya, In a Whirl of its Own". The Guardian. Retrieved November 12, 2016. "7 Good Eats in Konya". My Traveling Joys. Retrieved November 12, 2016. ^ a b "Financial Times: Reports — Anatolian tigers: Regions prove plentiful". Ft.com. Retrieved 7 August 2018. ^ a b root. "Anatolian Tigers". Investopedia. Retrieved 25 May 2015. ^ a b "Zaman: Anatolian tigers conquering the world". Archived from the original on 2013-08-21. Retrieved 2013-08-21. ^ a b "Konya". Encyclopædia Britannica. Retrieved 25 May 2015. ^ see William Ramsay, Cities of St. Paul, 315–384; F. F. Bruce, Paul: Apostle of the Heart Set Free Grand Rapids, MI: Eerdmans, 1977. p. 475. ^ a b c d Foss, Clive (1991). "Ikonion". In Kazhdan, Alexander (ed.). Oxford Dictionary of Byzantium. London and New York: Oxford University Press. p. 985. ISBN 978-0-19-504652-6. ^ "Bir Hata Oluştu". Hvkk.tsk.tr. Archived from the original on 5 May 2015. Retrieved 25 May 2015. ^ Mehmet Kayhan YILDIZ- Hasan BÖLÜKBAŞ- Serdar ÖZGÜR- Tolga YANIK- Hasan DÖNMEZ/ KONYA,(DHA). "TSK yeni yıldızı Barış Kartalı'na kavuştu". HÜRRİYET - TÜRKİYE'NİN AÇILIŞ SAYFASI. Retrieved 25 May 2015. ^ "Turkey takes delivery of military aircraft". TodaysZaman. Archived from the original on February 22, 2015. Retrieved 25 May 2015. ^ "IFMSA Exchange Portal". Exchange.ifmsa.org. Retrieved 7 August 2018. ^ "Updated world map of the Köppen-Geiger climate classification - Hydrology and Earth System Sciences Discussions" (PDF). Hydrol-earth-syst-sci-discuss.net. Retrieved 7 August 2018. ^ "Klimatafel von Konya / Türkei" (PDF). Baseline climate means (1961–1990) from stations all over the world (in German). Deutscher Wetterdienst. Retrieved 13 January 2019. ^ "Konya Necmettin Erbakan Üniversitesi". Web.archive.org. Archived from the original on 27 April 2015. Retrieved 25 May 2015. ^ "KTO Karatay Üniversitesi". Karatay.edu.tr. Retrieved 2011-09-16. ^ a b c "General Overview Of The Konya Economy". En.kto.org.tr. Retrieved 25 May 2015. ^ "History « Kombassan Holding". Kombassan.com.tr. Archived from the original on 2015-05-25. Retrieved 25 May 2015. ^ (in English) "Škoda Transportation wins Konya tram contract". Retrieved 2013-09-05. ^ "Opening of Ankara - Konya fast line completes strategic link". Railway Gazette. 24 August 2011. Retrieved 2013-02-12. ^ "Invensys commissions ERTMS solution on Turkish High Speed Line". European Railway Review. 7 September 2011. Archived from the original on 20 December 2011. Retrieved 20 December 2011. ^ Battutah, Ibn (2002). The Travels of Ibn Battutah. London: Picador. pp. 106, 309. ISBN 9780330418799. ^ Kiminas, Demetrius (2009). The ecumenical patriarchate : a history of its metropolitanates with annotated hierarch catalogs. San Bernardino, CA: Borgo Press. p. 100. ISBN 9781434458766. ^ "Introduction to Orkut". Programmerworld.net. Retrieved 25 May 2015. ^ McLean, B. Hudson (7 August 2018). "Greek and Latin Inscriptions in the Konya Archaeological Museum". British Institute of Archaeology at Ankara. Retrieved 7 August 2018 – via Google Books. ^ "BBC NEWS - Europe - 'Islam problem' baffles Turkey". News.bbc.co.uk. Retrieved 25 May 2015. ^ "Konyalım". Bekirhoca.com. Archived from the original on 28 September 2007. Retrieved 25 May 2015. ^ a b "Konya Büyükşehir Belediyesi". Konya.bel.tr. Retrieved 25 May 2015. 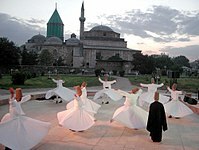 ^ a b "Rumi Remembered in Birthplace of Shams". Archived from the original on 7 April 2015. Retrieved 21 March 2015. ^ "PAKISTAN – TURKEY JOINT STATEMENT" (Press release). Islamabad, Pakistan. Pakistan Ministry of Foreign Affairs. 2008-10-31. Archived from the original (HTML) on 2012-02-11. Retrieved 2018-03-30. Wikimedia Commons has media related to Konya. ArchNet.org. "Konya". Cambridge, Massachusetts, USA: MIT School of Architecture and Planning. Archived from the original on 2012-10-23. Retrieved 2013-02-10. "Konya". Islamic Cultural Heritage Database. Istanbul: Organization of Islamic Cooperation, Research Centre for Islamic History, Art and Culture. Archived from the original on May 16, 2013.